Here in the sunny southwest, the weather is usually, well..............sunny! Not this month, however. The skies are dark. Rain is falling and thunder is clapping in celebratory fashion. And me, I'm applauding right along with the thunder! It's been so long since we were blessed with rain, I am thrilled with the change in our weather. The welcome moisture has not only cleaned the dust from the air, but filled it with a wonderfully fresh aroma. No more stale air, here! And surprisingly, despite the gloomy darkness, everyone I meet seems upbeat, revived and rejuvenated. It is as though the rain has left the whole town feeling new and alive again. It's amazing what a few good raindrops can do! The same can be said about tears. So often we try to keep our life sunny - free of overcast skies and teardrops. We somehow feel tears will only ruin our day and get everything in our life soggy. 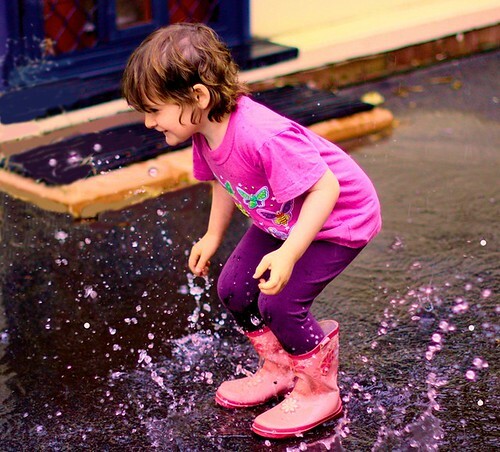 How, like the rain, we should welcome the "rainy times" of our lives. Tears, like the rain, can do wonders to wash the dust, the hurt, and the stale air out of our life. They are also God's way of bringing much-needed healing and refreshment to a heart that has become parched from the winds and heat of life. Are you experiencing a rainy time in your life right now? If so, don't draw the curtains of your soul and hide inside until the storm passes. Instead, walk out into the downpour, leaving your umbrella safely tucked in your hall closet. Let them soak all the way down to the deepest place of your heart. As God waters your spirit with His forgiveness, His peace, His hope, His love and His joy, you will see new life start to sprout up where only despair and gloom once tried to take root. Welcome this season into your life and allow it to renew you and revive you. Hi Stacy - great post and a great reminder that tears cleanse and heal. Beautiful encouragement, Stacy. Thank you.